This sofa table features two storage drawers on top and a shelf across the bottom. A great piece for an entrance or large hallway, or match it up in a living room, family room, study or den with the many matching pieces. The Metro II 2 Drawer Sofa Table by Riverside Furniture at AHFA in the area. Product availability may vary. Contact us for the most current availability on this product. 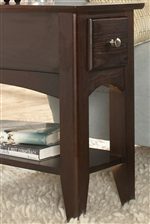 Case Detail Solid hardwood tapered legs. Storage 2 Drawers on top and a shelf on the bottom. Drawer / Shelf Construction It¹s the cabinetmaker¹s choice for making drawer joints that won¹t pull apart over the years. 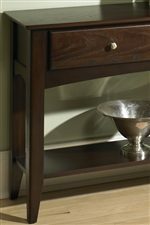 Craftsmen dovetail joints both in the front and the back of the drawer. We spend a little more time here so that drawers will hold ³stuff² for years to come. Drawer Suspension Wood on wood glides. The Metro II collection is youthful in spirit with clean simplicity. The entertainment and occasional group has ultimate storage function. 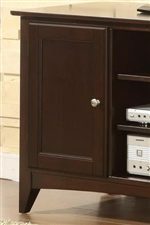 Featuring hardwood and oak veneer finished in deep ebony brown, a look that will blend in most decors. Great for your living room, family room or den. Bring some warmth home with the Metro II collection. The Metro II collection is a great option if you are looking for Casual furniture in the area. Browse other items in the Metro II collection from AHFA in the area.